Summer is coming, and it’s the perfect time to make some improvement in your outdoor living space. You have to make your home as enjoyable as possible to welcome that exhilarating weather. Obviously, building an outdoor kitchen in your own backyard is one of the best ideas to enjoy the summer breeze outside. You can have and prepare a fun outdoor meal with your friends and family comfortably when you have one right in your backyard. 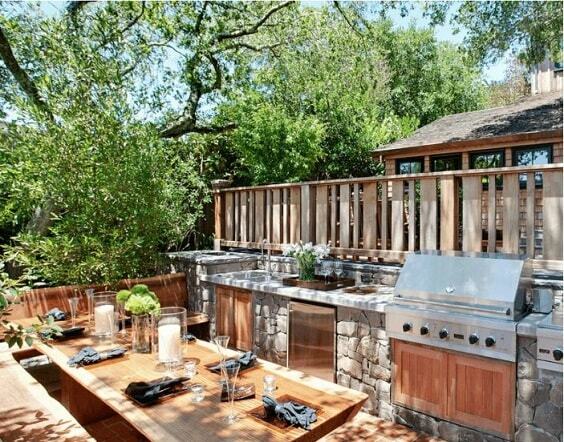 Yeap, an outdoor kitchen always becomes a nice addition to every house that you can consider to have. 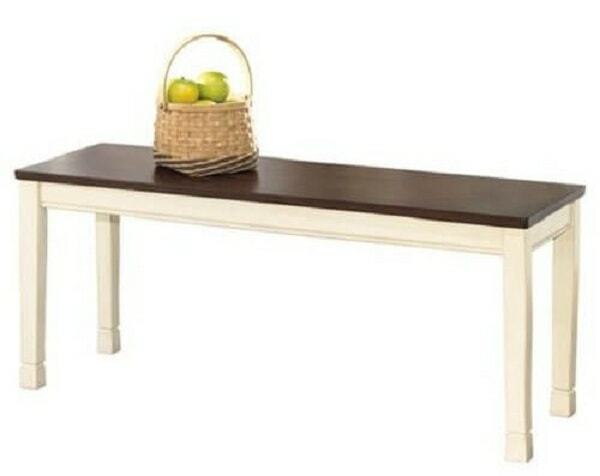 It will provide a convenient spot to create some unforgettable summer experiences in your beloved home. Here, we share you some inspiring outdoor kitchen ideas which look so mesmerizing to give your outdoor space a more joyful place. They are totally worth to include on your inspiration list when you are about to build one. 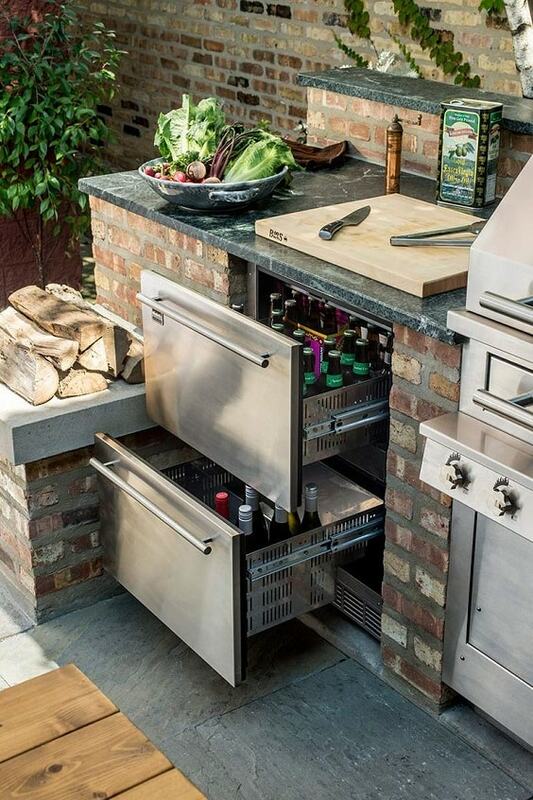 So let’s just keep scrolling to check our best pick of outdoor kitchen ideas! The pergola is long known as one of the most popular shades for an outdoor space. Here, the pergola is installed in the outdoor kitchen area which doesn’t only give a cozy shade but also makes it look more awesome. If you have a circular spacious patio, this outdoor kitchen ideas can be the best option to try. The kitchen itself is installed on the edge of the patio which makes it also work as its border. You can see how the kitchen is huge enough to handle lots of appliances that you can use conveniently. 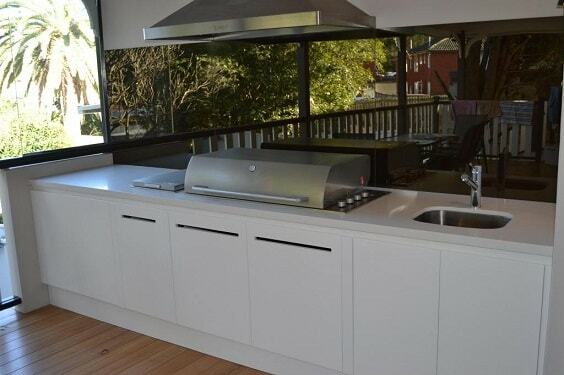 This one shows a modern outdoor kitchen which is installed in a stand-alone style next to the pool. It makes the kitchen become one of the major focal points in this jaw-dropping outdoor space. The design of the kitchen itself is simply minimalist with the white and gray finish. 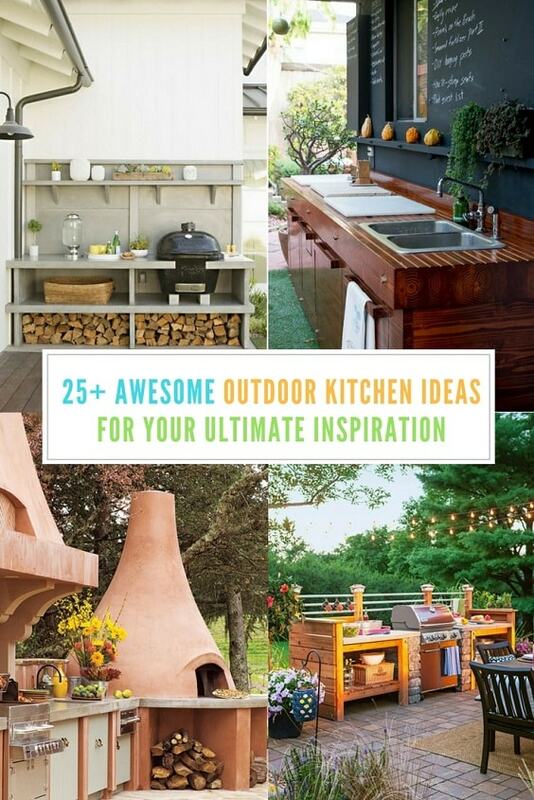 It’s surely the great inspiration for your outdoor kitchen ideas. The distinctive outdoor kitchen ideas which use the corrugated tin as one of its main materials. It creates such a traditional look that will make your backyard look attractively unique. 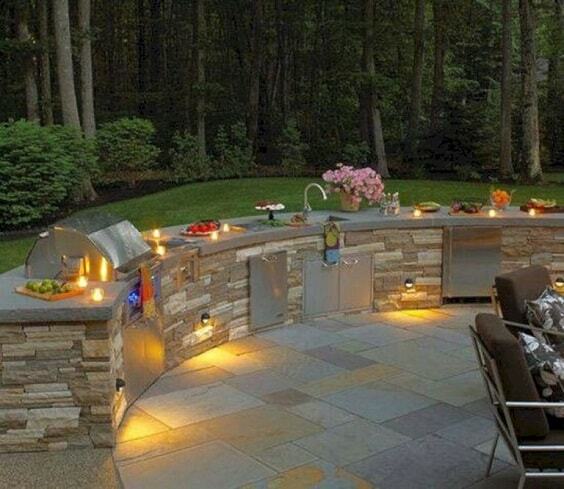 This one is a great reference when you are looking for the outdoor kitchen ideas on a budget. 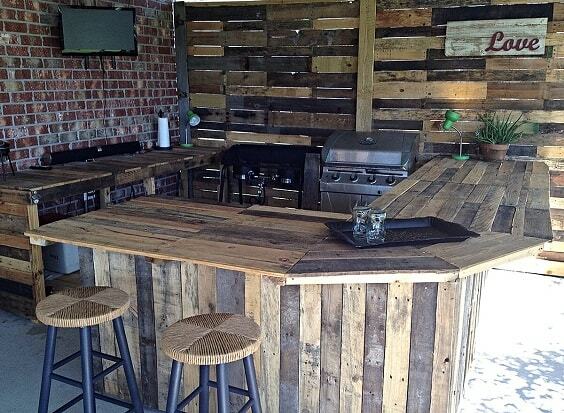 Choosing the rustic theme for your outdoor kitchen is surely the best idea to apply. This one shows a beautiful shabby chic layout with the combination of white-washed brick and stone materials. It flows well with the earthy surrounding in your backyard and adds another style to its layout. 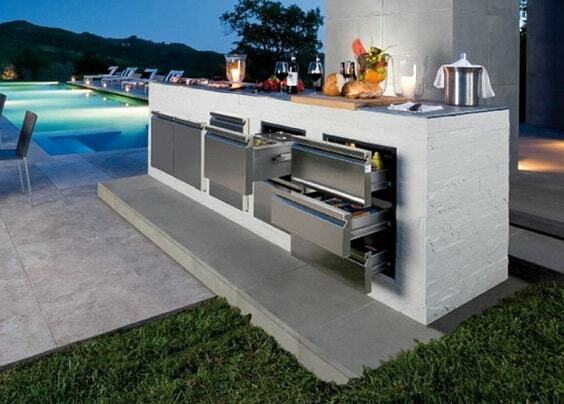 The simply admirable outdoor kitchen ideas with a little bit of industrial touch which looks so tempting to copy. It’s designed in a small size yet still provide good convenience to cook some fun foods. 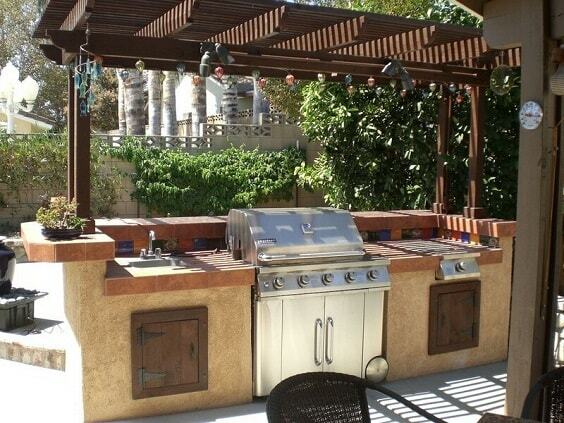 This outdoor kitchen can be a good reference for you who have a limited space in your backyard. 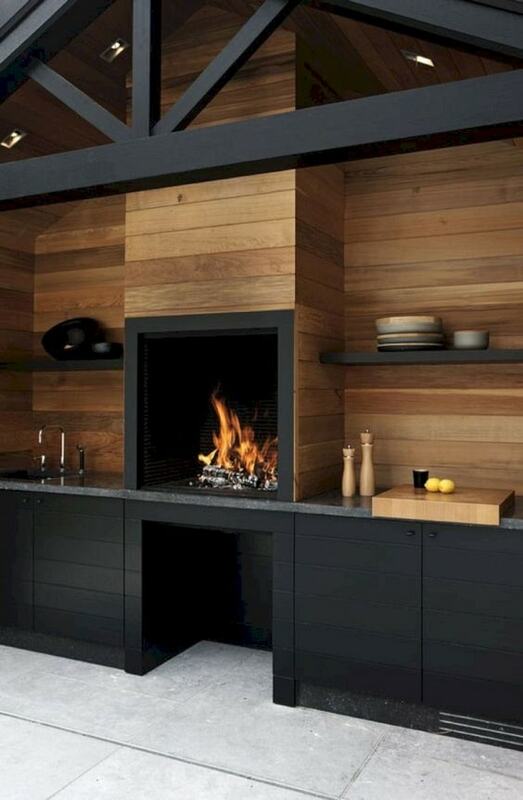 You will love the combination of black and earthy brown look of this all-wood outdoor kitchen with marble countertop. 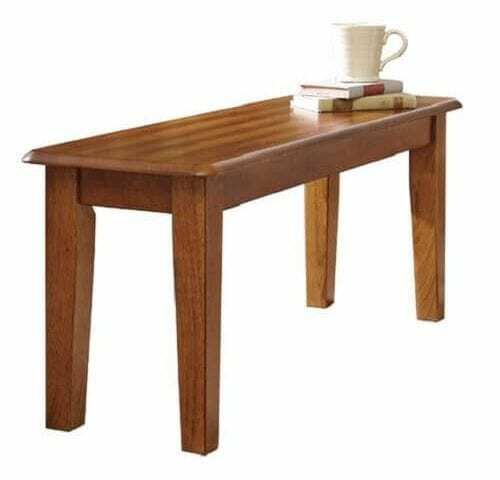 It’s designed in a gorgeous minimalist style which makes it fit well both for traditional or modern outdoor layout. In addition, a firepit is installed in the center of the countertop which brings the style of this outdoor kitchen ideas to a whole new level. Moreover, the firepit also works as the divider between the sink and kitchen area. To provide a better shade, some trees are placed around the kitchen area which also makes it look more mesmerizing. 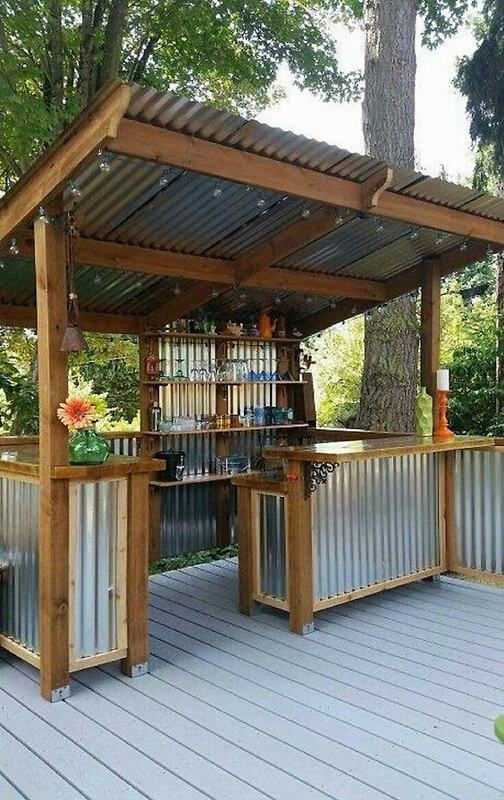 This one is a great inspiration for you who are DIY enthusiasts and willing enough to build your outdoor kitchen all by yourself. The construction of the kitchen is dominated by wood all in its natural look and combined with the black stone countertop. 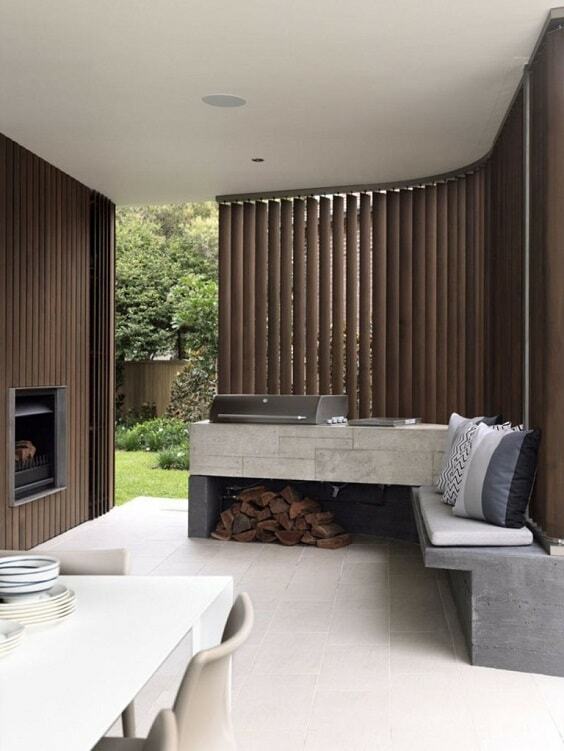 The kitchen itself is placed right in front of the wood screen to create a nice harmonious look. The washed look is one of the most adored layouts of the kitchen which is popular up until today. It creates such a bright nuance with the traditional feels that will make the kitchen look so gorgeous. In this outdoor kitchen ideas, the cabinet and backsplash are finished in gray-washedA�and combined with the corrugated tin roof. The combination creates a traditional farmhouse layout which is so inspiring to copy. 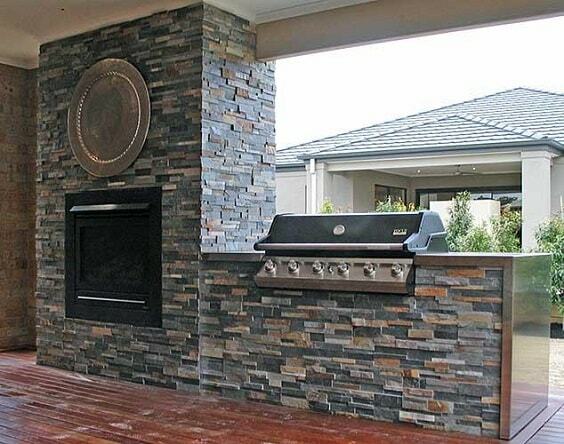 As you may have known, there are so many homeowners who choose the outdoor kitchen with the rocky look. You can also find hundreds of manufacturers which produce the outdoor kitchen which uses rocks as one of its main materials. 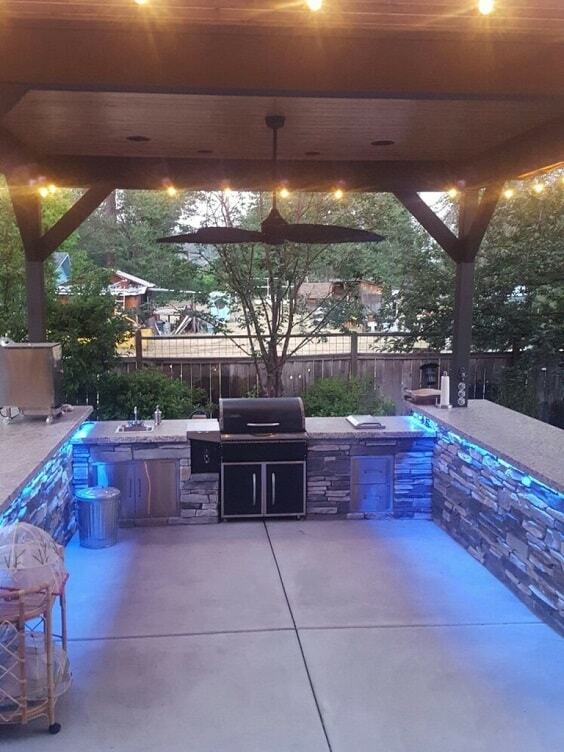 Here, the U-shaped rocky outdoor kitchen in the white and grey finish is uniquely equipped with the blue LED light. It makes the kitchen has such a stylish combination of modern and natural look. A beautifully smart outdoor kitchen ideas with the simple long design with the huge storage which can be used to store lots of kitchen stuff conveniently. 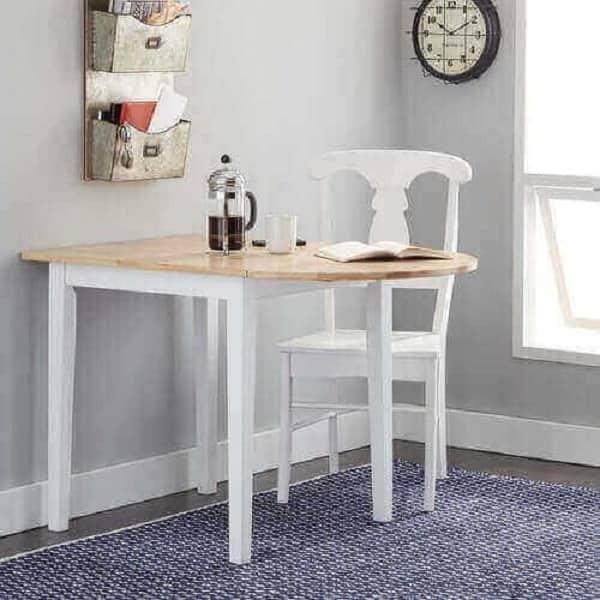 It’s simply finished with white and which is enough to make it look stylishly chic. You can see how the wood logs and storage add another touch to the overall look of the kitchen which makes it way more attractive. 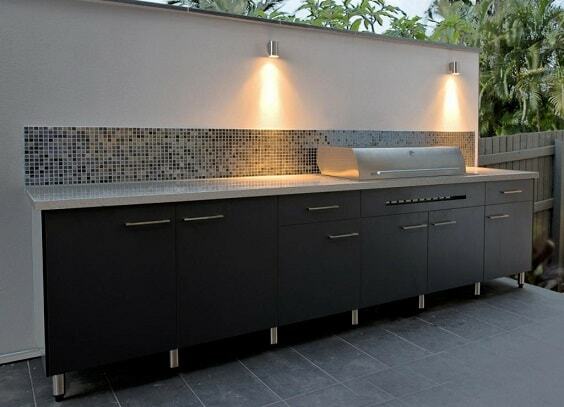 The main factor which makes this outdoor kitchen ideas look so distinctive is its backsplash. 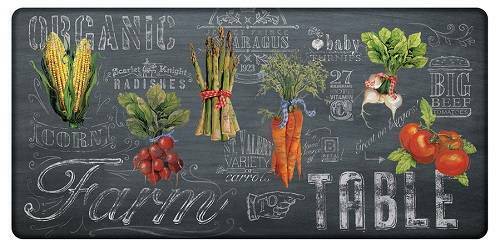 It’s a chalkboard backsplash which can work well to write some daily plans or recipes. The kitchen looks stunning with its solid look in the grainy wood finish which creates a contrasting look to the chalkboard backsplash. 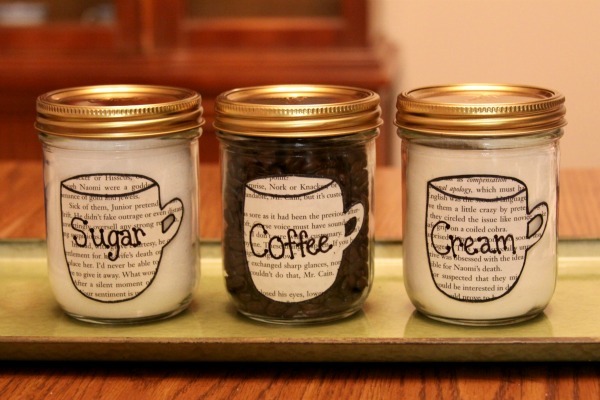 Some kitchen-themed decor items and greeneries are placed on the open shelf to add another stylish touch. The awesome outdoor kitchen ideas in modern style with the matte deep gray finish and white countertop which is so tempting to have.It’s designed in a sleek simple look which will add such a minimalist touch to our outdoor living space. With such design, the kitchen is like an oasis among the traditional and natural layout of this backyard. This small outdoor kitchen is built with three main constructions which are two brick and wood structures and the portable backyard grill. 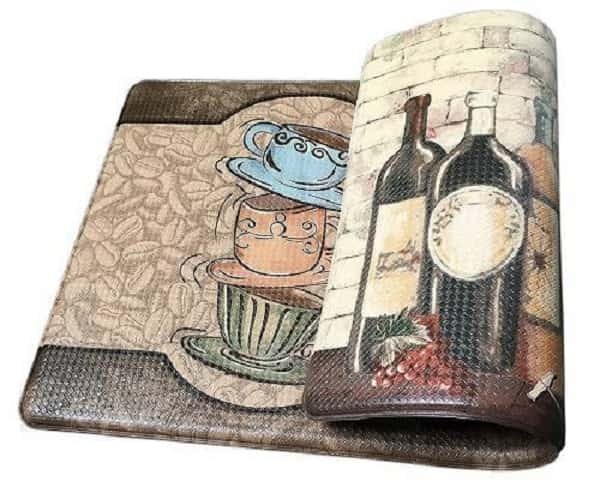 The combination is smart enough to provide a convenient cooking spot for your patio. 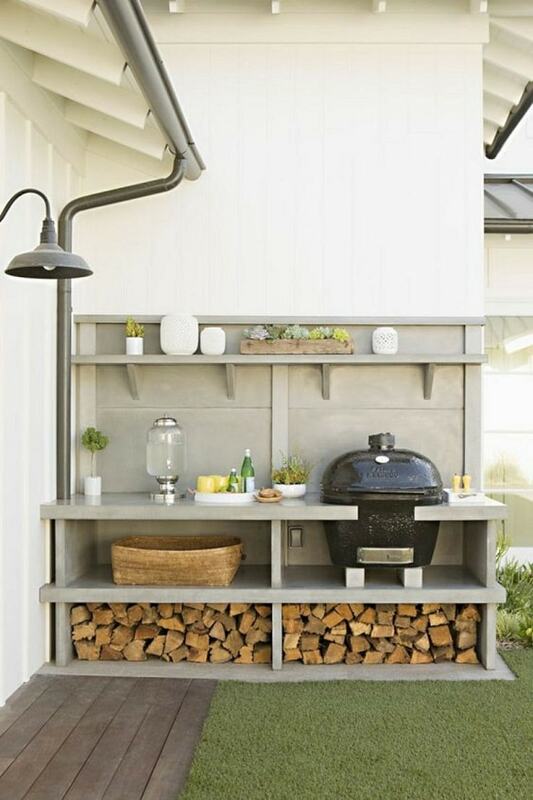 It’s surely the simple inspiration to include in your DIY outdoor kitchen ideas. which you can try to build at home. The naturally rustic cedar cabinet is mixed beautifully with the metallic countertop and appliances. It creates such a distinctive look that will add another style to your outdoor space layout. It’s so undeniable that an all-white layout is always every homeowner’s favorite, and this outdoor kitchen ideas is the one that you can’t miss. The design of the kitchen is quite simple in all-white look with the stainless steel appliances and hardware. Since the kitchen is placed on the laminated wood flooring, it creates such a stunning contrasting look which (again) combines the natural and modern style at once. Choosing the earthy-themed outdoor kitchen layout is surely a nice idea to create such a harmonious look with the natural surrounding. 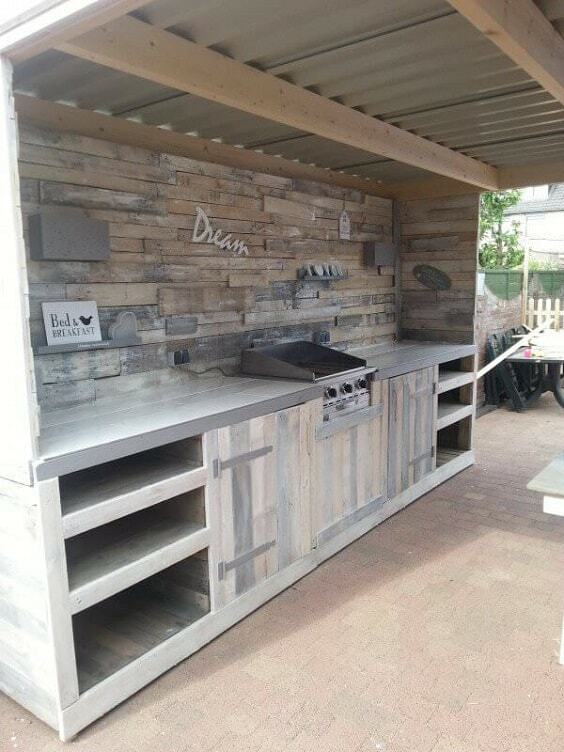 Here, the rocky outdoor kitchen with wood cabinet in natural finish is stunningly built on the rustic patio. All the elements of this backyard flow well side by side to create a very inviting atmosphere that everyone will surely love. 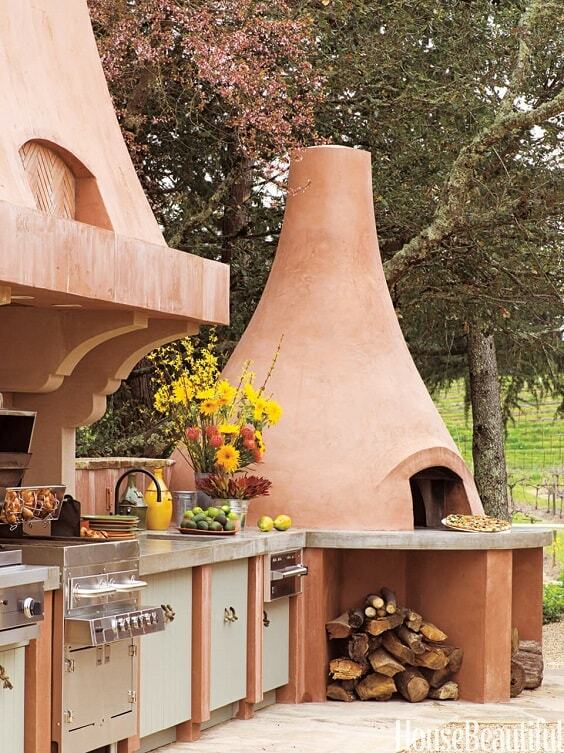 The pizza oven is totally a great addition to every outdoor kitchen that you can consider to have. As you can see, the oven is made as a major focal point in this outdoor kitchen ideas which definitely inspires us to build the same one. The construction of the kitchen is dominated by the adobe and concrete with the Southwest style which is distinctively beautiful. 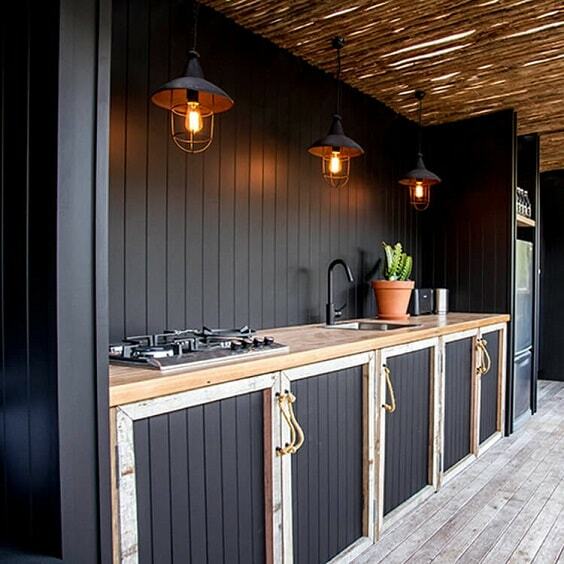 It’s perhaps safe to say that every modern kitchen always involves stell as one of its basic materials, and this one is an inspiring outdoor kitchen with such style. The construction of the steel is mostly made of steel which creates an ultimate modern look. Surprisingly, the kitchen is installed on the wooden flooring with the earthy stone walls, giving a classic natural twist to its overall look. The color choices of this outdoor kitchen ideas is beautifully mesmerizing. It combines black and natural finish with wood as the main material for its construction. The lightning and washed wooden flooring of this layout create a chic industrial look which is so inspiring to try. 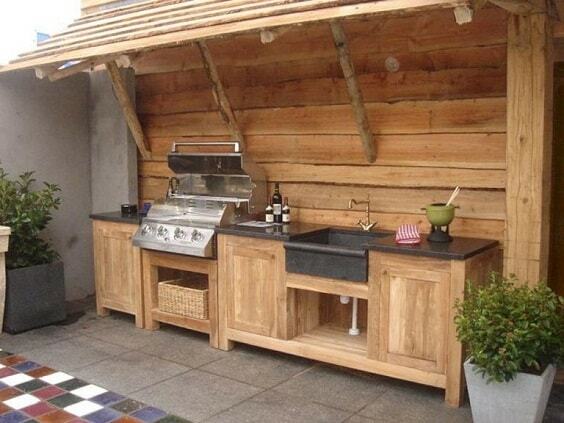 This one is a stylish outdoor kitchen ideas which can be a good inspiration for you who love the rustic stuff. Brick and concrete are used to construct the structure of this outdoor kitchen which creates a gorgeously distinctive look. The black stone countertop completes the kitchen very well. Then, the metallic refrigerator in the metal finish is added to provide a better convenience and also adds another style to its design. A portable outdoor kitchen is a good option if you just need a smaller and more practical one to use. 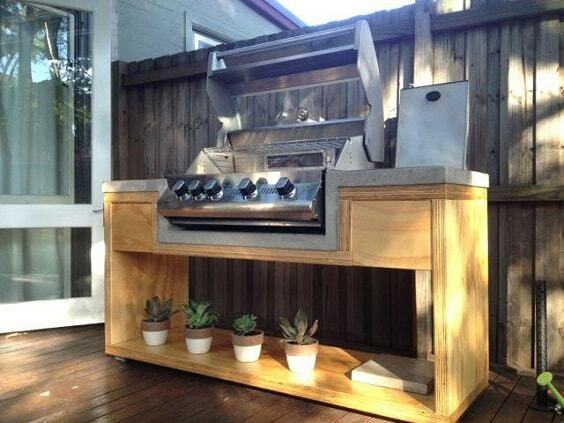 This one is a simple portable outdoor kitchen which is mainly made of wood and concrete. It’s designed in a very simple way but enough to provide a cozy cooking spot even with spacious storage. 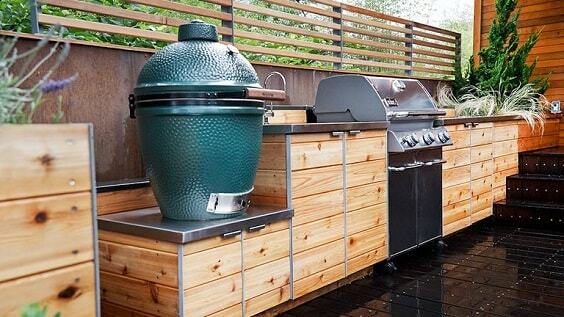 You can include this one in your DIY outdoor kitchen ideas list. The distinctive-looking outdoor kitchen ideas with the concrete construction in washed white and grey finish which is so worth to be one of your best inspiration. Its color combination creates a traditional yet minimalist look beautifully. You can see that it’s installed in an L-shaped style with the kitchen and a seating area in one design. For sure, it’s a good option for you who have a small-narrow outdoor space. 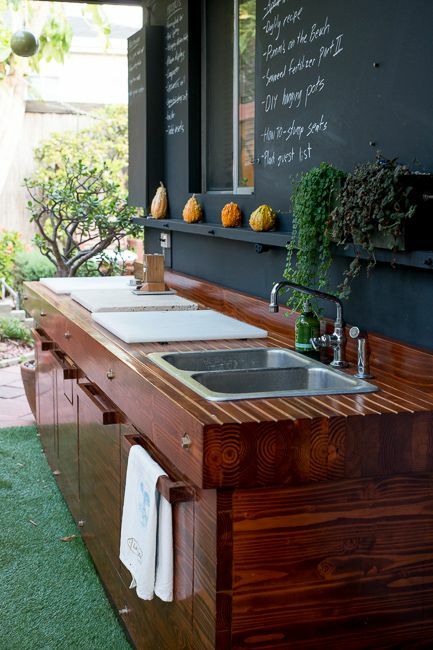 The wooden look with different tones of this outdoor kitchen ideas is so amazing. It makes such a decoratively natural nuance which is stylish enough to make your backyard become way more attractive. 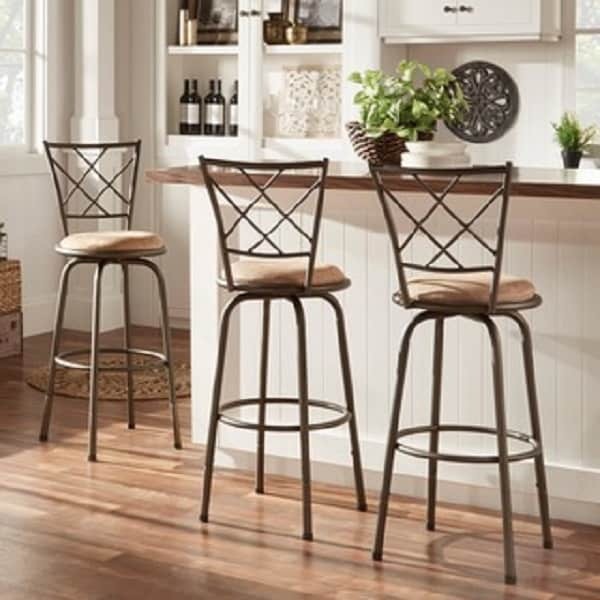 It also has the bar area with the vintage stools to provide the cozy seating spot while also makes it look and feel more inviting. An all-wood outdoor kitchen is totally a nice option if you want a superbly natural one to compliment your outdoor living space. 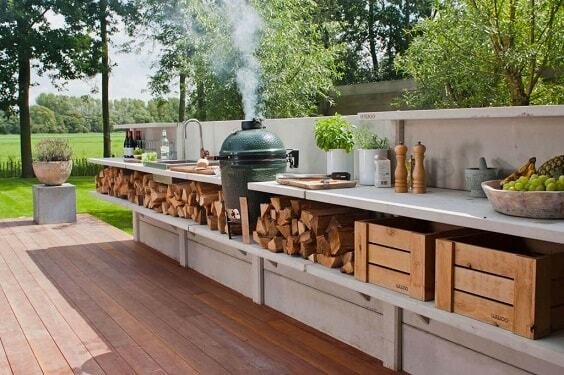 In this outdoor kitchen ideas, wood planks are used to build up its overall construction which looks admirable. The stainless steel grill is then installed to provide a cozy cooking area which also gives another look to the kitchen. 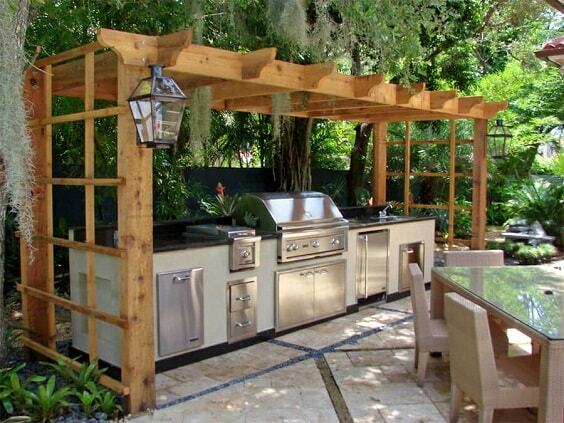 Another outdoor kitchen ideas which uses pergola as its additional feature. The kitchen is built in an L-shaped structure which consists of prep, sink, and grill area. It’s a free-standing outdoor kitchen which installed separately from the patio or deck. 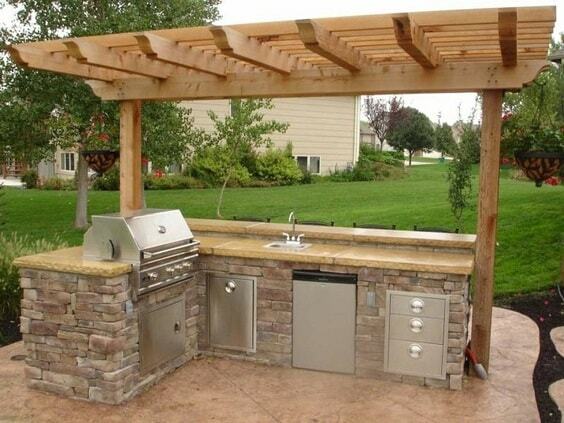 The design of this outdoor kitchen fits well for you who love the one with the shabby-chic look. It’s finished on weathered all-white which is so stylish and distinctive at the same time. 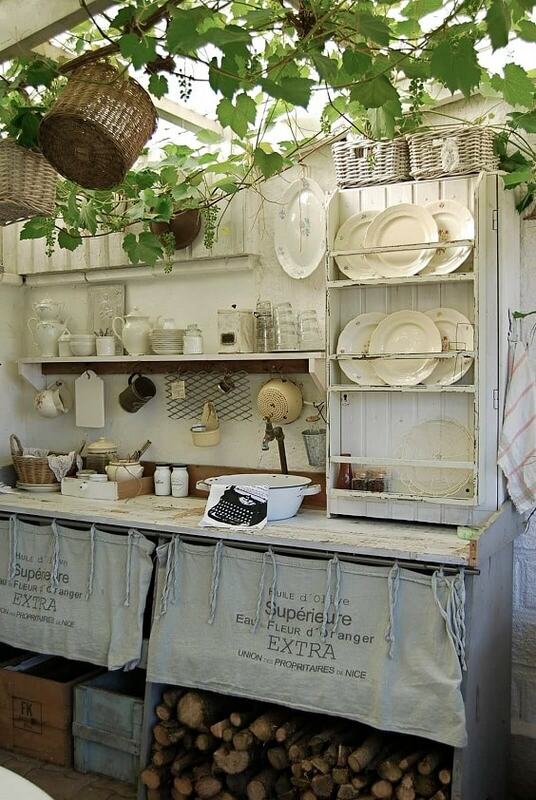 Notice the sack fabrics which are used to cover the open shelves which emphasize that, indeed, this outdoor kitchen is made in shabby-chic style. 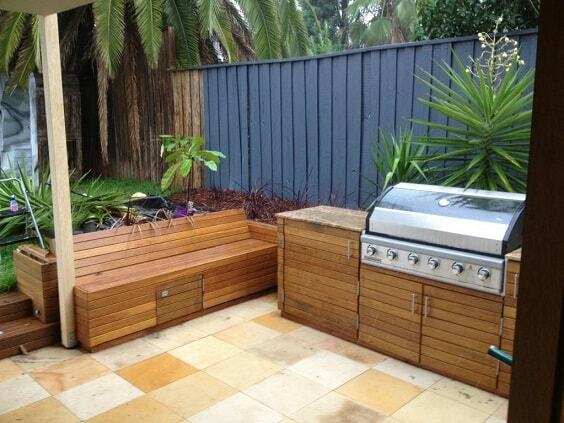 The catchy outdoor kitchen ideas which is covered with slats in various attractive finishes. It makes the kitchen look festively catchy in a natural way that will make it become the main focal point for every outdoor space. 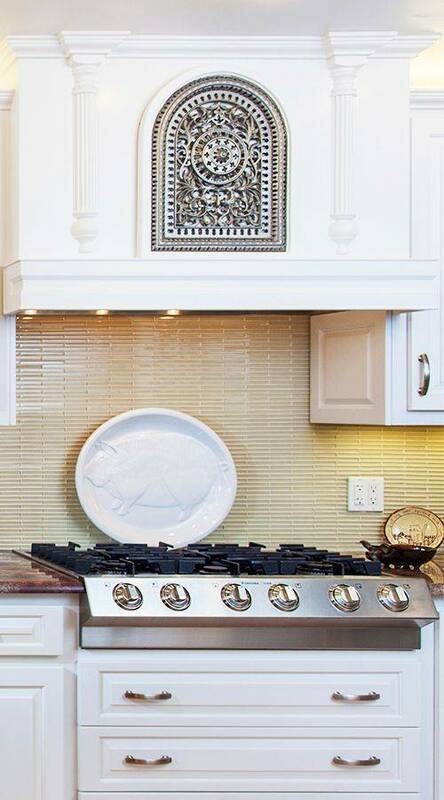 The oven area is made over-sized in purpose so that it can also work to display some decor items. 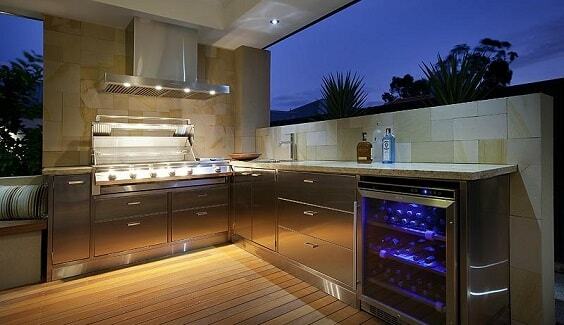 So those are some incredible outdoor kitchen ideas which will surely inspire you to have one. You can use them as the reference for your outdoor space improvement project. 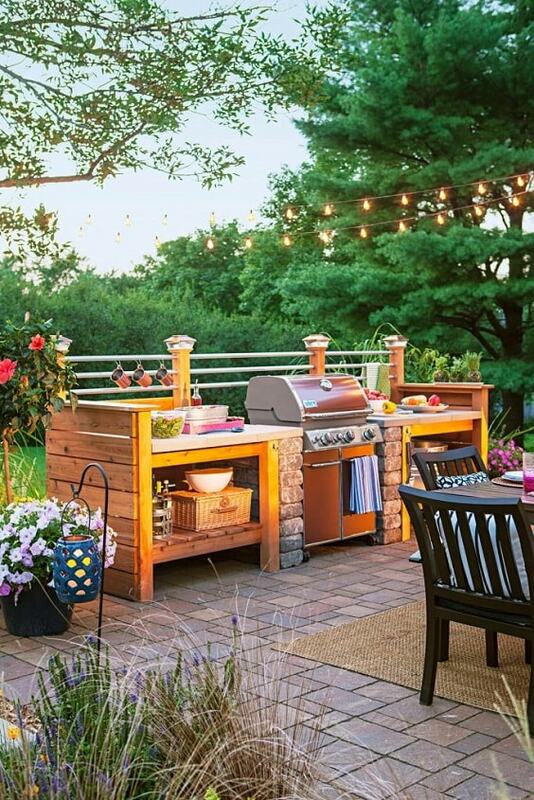 Building an outdoor kitchen is always a good idea to provide a better attraction in your backyard. 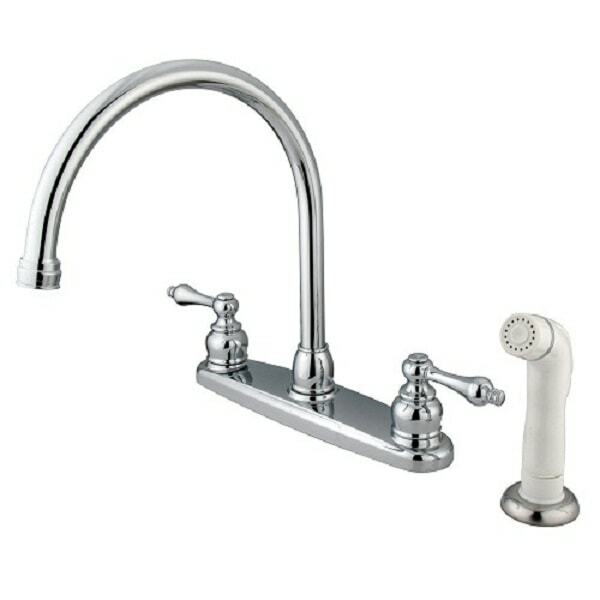 It provides lots of benefits for you as the homeowners and, of course, entertain all the coming guests. Moreover, you can hold a fun outdoor dinner or even party when you have your outdoor kitchen installed next to the existing patio. For sure, you can call your very own backyard as the perfect one when you have an outdoor kitchen and patio around. In addition, in case you wonder how much an outdoor kitchen cost is, well, the one average one can cost you around $10,000. 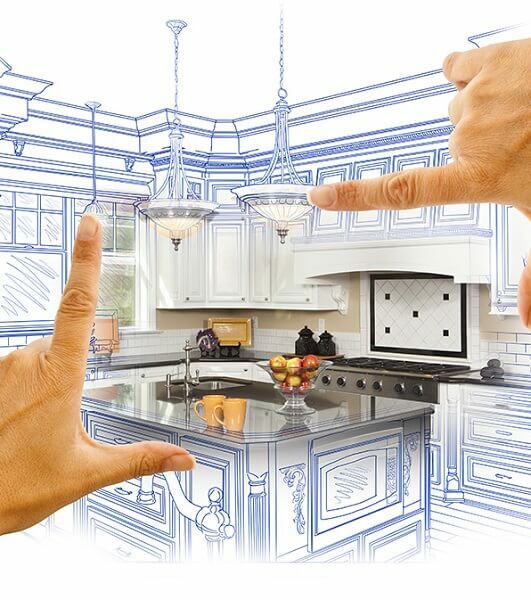 You will get a convenient complete outdoor kitchen with this budget which is enough to entertain the whole family. So now, there is no doubt anymore to add an outdoor kitchen in your backyard since those ideas are very tempting to try. 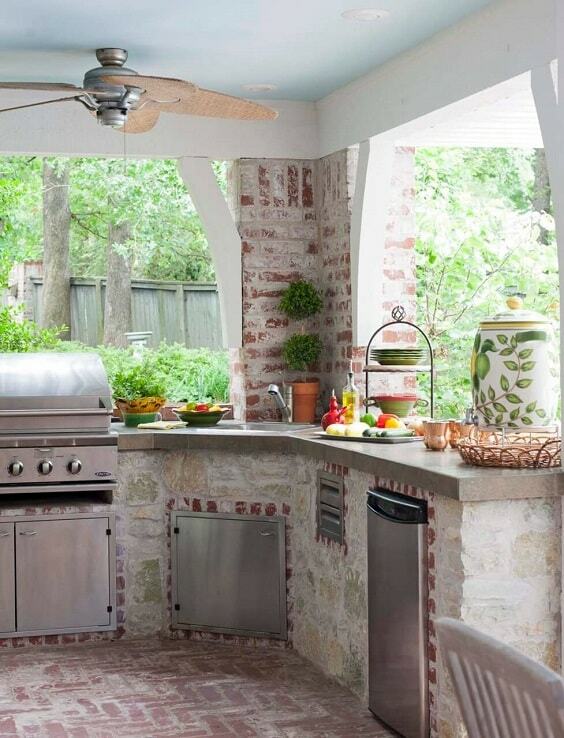 It’s your turn to pick one of those outdoor kitchen ideas to be yours!